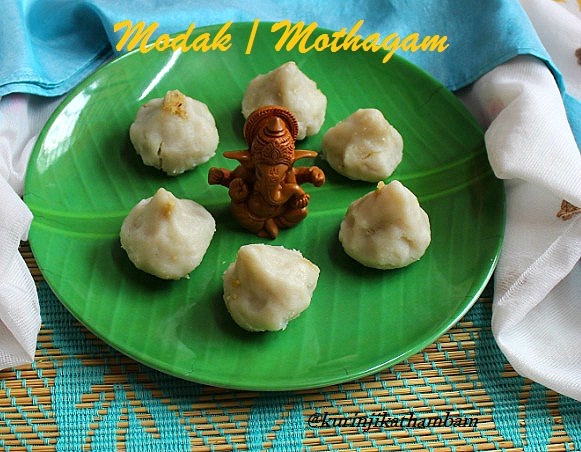 Modak or Mothagam is a traditional recipe for Vinayakar Chathurthi. I have sticked entirely with the traditional procedure. 1. Heat the pan, add grated coconut, jaggery syrup and cardamom powder. Mix them well and keep the flame at simmer. If you use powdered jaggery, add 3 tbsp of water and mix them well. 2. Stir occasionally and cook till the mixture become thick. This will take 5-7 mins. Keep it aside and allow it to cool down. 1. Take the water in a heavy bottomed pan, add salt and sesame oil. 2. When the water starts to boil, switch off the flame. 3. Immediately add the rice flour slowly. Stir it continuously without any lumps. Use thick handle ladle for mixing the dough. 4. 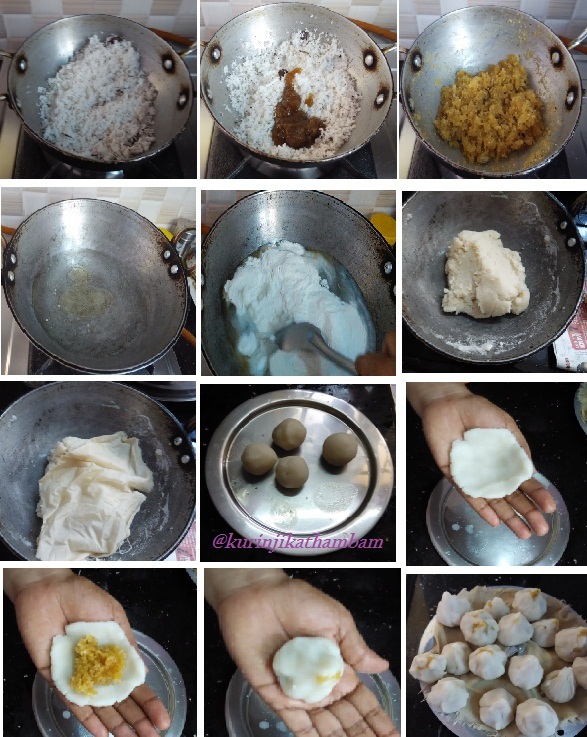 Mix the dough till the dough does not stick on the sides of the pan and it becomes like chapathi dough. Leave it for 2 mins and knead the dough with your hands. 5. Now close the dough with wet cloth. Otherwise the dough becomes dry. 6. 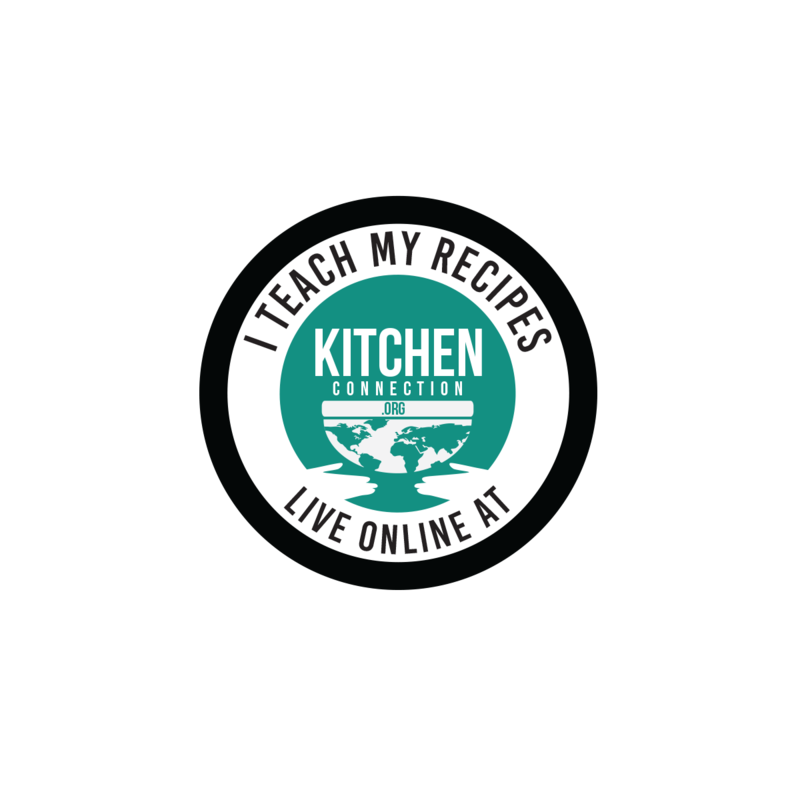 Make lemon size balls from the dough. Either flatten the ball or make small cup from the ball. At this time you can grease your hands with oil. 7. Fill it with coconut filling / poronam and close it carefully like a modak. Do this step for all the balls. 8. Steam cook the modaks for 10 mins in a steamer. Now modak/mothagam is ready for padaiyal.